Hello everyone! 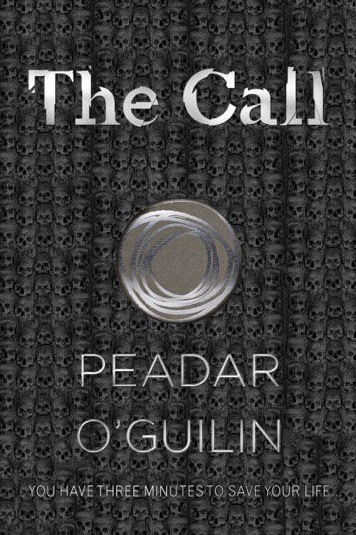 In this post I’m going to be looking at “The Call” by Peader Ó Guilín which I finished yesterday. It was the first of 10 books I aim to complete this December, so I’ve made pretty good going so far! First of all, I just want to say that rating systems aren’t always “accurate”. To me, 3/5 is really good, I rarely give out 5/5. However, to someone else, 3/5 might be “meh”. So with that established, let’s get more into what I thought about the book. In this book you’re basically following one main character, the story played through her eyes. She is in a school where they train all the children to prepare for “The Call”. She has a few obstacles she needs to overcome, and these play a vital part in the story. You follow her through her ups and downs in training, relationships with friends and guys, her difficulties in overcoming her issues and how everyone copes in this dark, twisted world they currently live in. Firstly, the fact that this is set in Ireland interested me because I am Irish. They actually mention the town that I’m from at one point in the book, which is pretty cool because we’re quite a small town. I really enjoyed the world that Peader has created, it’s honestly not like anything I’ve experienced before. Just when you think you’ve ‘experienced’ all there possibly could be to this world, he throws in more twists and turns and keeps you hooked on this dark, twisted world. You do get emotionally involved in this book pretty early on for various reasons. I won’t go too much into detail, as I don’t want to give out any spoilers. For me it was a little hard to grasp sometimes just because the world was so ‘out there’, I did have to reread a few sections. But honestly, that’s not entirely a criticism because he definitely wasn’t following the usual tracks, it really was an individual story. Pretty early in to the story, I made the decision that it was going to go one of two ways. One ending would have annoyed me, the other would have been a stereotypical ending. However, even though it did go partly a way I had thought, it definitely didn’t end the way I expected. There were also characters in the story that I expected to survive that didn’t, and characters that changed. At one point there’s a plot twist and you don’t know who you can and can’t trust. This was such an interesting aspect for me, there wasn’t much option for the characters here. And again, it didn’t go the way I had expected. All in all, this has been a pretty vague review. I do apologise for that, but there’s honestly only so much you can say about this book without throwing out spoilers. I definitely think it’s worth the read. You do have to invest in it, it’s not a “light” reading book in my opinion. It needs time, patience and your attention to fully take in what this story is about. That’s just a quick post for tonight, I hope you enjoyed. There are many places you can purchase this book, the most popular probably being Amazon.